The HeatTrak® Industrial Snow-Melting Walkway Mat is an electrically heated mat designed to prevent snow and ice accumulation around the home or facility. As opposed to the HeatTrak Residential Products which are made exclusively for residential use, the HeatTrak Industrial products are designed for commercial facilities or areas with heavy foot traffic. The Industrial Walkway Mat is made of an electrically operated heating element sandwiched between two protective surfaces of flame retardant reinforced SBR rubber, making it as durable as automobile tires and allowing it to endure harsh wear. It plugs into any standard 120V or 240V outlet generating heat to melt snow at a rate of 2" per hour. The mat can be secured to the ground using its built-in grommet holes and is designed to be left outside for the entire winter season. 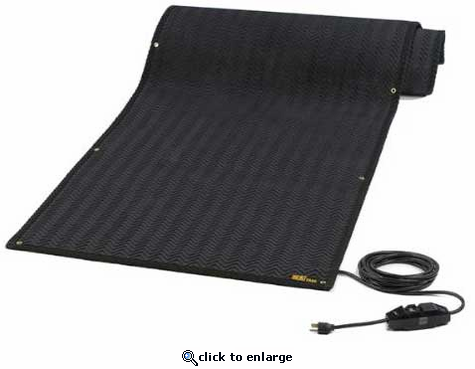 Each Industrial Snow-Melting Walkway Mat comes with its own ELCI plug (equipment leakage circuit interrupter).